The textile workers in the organised industrial zone of Antep, a city on the border of the Kurdish area of Turkey, recently went on a strike against their working conditions, low wages and cuts in their bonuses. 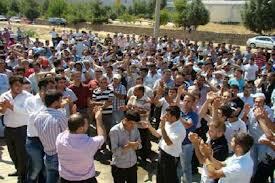 The strike, which started with the participation of 3 to 5 thousand workers according to different sources, quickly spread to a total of seven factories in the industrial zone, including a total of 7 thousand workers. About their working conditions, the workers whose working hour is on average 12 hours were saying the following: “What we want is just wages which will suffice to feed our families and our social rights. We don't want anything else. We have nothing against anyone in particular. Nor do we have ill intentions, we want what we deserve”. A worker who participated in the strike expresses how the Turkish bourgeoisie, which recently has taken an important step in furthering its solid integration into the web of international imperialist relations under the slogan of “becoming a superpower”, was spreading nothing but false hopes in its 'addresses to the nation': “They say we are second only to China in the economy. They say we are pioneers when it comes to exports. No one is asking how much this reflects on the workers, how much bread the workers can afford when going home. No one cares about the worker. We've been on strike here for days, and the human demands of thousands of people are being ignored”. The agreement for a ridiculously low pay rise between the union and a factory boss, for instance, is among the reasons triggering the strike. The workers who, when they figured out that the union negotiated a 45 TL pay rise, which almost means a zero rise, immediately went on strike in July. In fact Mehmet Kaplan, the Antep Regional Chairman of the Oz-Iplik-Is union, was held in the factory by the workers for a while after being met with slogans such as “sell-out chairman, sell-out union!” So the workers had concretised their direct strike against a union from the start. As the strike went on, the lackeys of the bourgeoisie continued their suppression through different means. The state, which sent its packs of dogs to the factories right from the beginning of the strike wave, tends to be very disturbed by workers' actions which aren't controlled by the unions. The “advice” given the workers by the policemen during the strike were striking: “If you don't accept this, you won't find work anywhere else ever again. The bosses can only afford so much. Accept it and go back to work.” It seems the actual police force is as knowledgeable as the police of the factories, the unions. On the eleventh day, the strike ended with real gains for the workers. Among the gains was a rise in wages from 780 TL to 875 TL. The workers in the Motif Textile factory will go back to work with 905 TL a month. Also thanks to this strike, the workers will get a 10 day bonus in every major national holiday. The bomb attack which led to the deaths of 9 civilians in Antep right after the strike quickly came to dominate the atmosphere in the city and dispersed the air created by the strike. In a country like Turkey where the public agenda is too easy to manage and very changeable, the news, which as in all other countries is managed by the bourgeoisie, is used to stop such movements from meeting up with the rest of the class. In fact the ruling class does everything it can to prevent the rest of the working class from even finding out about such strikes. For instance, while the significant Turkish media companies repeatedly reported the massacre of the South African miners by the police, this strike in the country they operate was evidently not seen fit to be reported, even as the tiniest piece of news in the television or the newspapers. Of course we are not surprised: it’s their public agenda to manipulate. And the workers who said the strike is ours have strengthened themselves. The bosses in some of the factories want to make the workers sign documents saying “I regret participating in the movement”. Against these maneuvers of the bosses, who are capable of all sorts of repressive measures, the workers are refusing to sign such documents. This strike is a corner stone for the working class movement in Turkey which progressed as a series of isolated struggles in single factories and workplaces after the TEKEL tobacco workers struggle, such as the struggle of the workers in Hey Textiles who were laid off for no good reason, and the Turkish Airlines strike. Certain details highlight the significance of the strike. The workers managed to meet almost all their needs throughout the struggle aside from some limited small aid which was given later during the strike. They acted together in subjects such as food, transportation and so on, and they took all their decisions with a committee they had formed among each other. One of the most important qualities of the strike was the fact that the workers had found a way of acting outside the union and among the most important gains of this self-organised strike is the fact that the workers took the initiative to take the struggle into their own hands. For the criticisms towards the union during the strike demonstrate that this is now a burning question for the workers: We don't need the union in our struggle. Besides, all the bourgeois left press writes on this strike, which was fully independent of the unions and was even against them, is that the workers will be discussing the need for stronger unions. The claim that the workers will discuss this when their struggle has been concretised in a place other than the union exposes another political maneuver. So instead of writing about the wildcat action itself, the bourgeois left can only make news corresponding to their trade unionist and pro-capitalist programs. Also, we see a remarkable difference when we compare the duration of struggles or strikes controlled by the unions and the ones which aren't. The former, while producing a wide anger against the union formations which are nothing but the apparatus of the state, also cause exhaustion and despair on the part of workers, especially when it comes to taking control of their own struggle. However, we can see, also taking into consideration the experience of the working class world-wide, that the movements managed and directed by the workers themselves always make proletarian history, and tend to be very successful at boosting morale. For the workers organise, manage and as we've seen in this experience, conclude these struggles themselves. On the one hand, the active will of the workers to struggle wins in merely 11 days, and on the other hand the strikes organized by the unions can turn into dead ends, wasting the energy of the workers and pushing them into despair over a period of months; and this results in new bad experiences filled with bitter disappointments for the workers. “Despite everything our wages rose from 780 TL to 875. This is not much, but is not a small pay rise. This strike might be over today; our struggle is not”. The workers, following the end of the strike, took the decision to organise a congress by their own struggle committee where they will discuss their own problems. While there are differing accounts of the details of the strike in different bourgeois news sources, what we see as significant is the fact that the workers are creating discussion platforms to clarify the gains of this wildcat strike and the struggle. “Unions are totally inconceivable without the existence of wage-labor, which in turn presupposes the existence of capital. As long as capital is held by individual owners engaged in competition and represented by many individuals and parties in the government, unions are at least able to bargain for an improvement in the conditions of labor exploitation. Their function is to regularize the sale of labor power, a function which has become indispensable to the modern capitalist system. From this fact comes their importance as complementary structures of the state, if not part of the state itself, everywhere in the world today (…) Their existence as an organization is entirely dependent on the continued existence of the labor/capital duality (…) However, they can side with capital as much as they choose without destroying this duality. On the contrary, they become increasingly indispensable to the maintenance of the capitalist system. As a result, the more gigantic and anonymous the concentration of capital, the more the unions take the side of capital and consider their role to be directly determined by the great ‘national’ interest”. Hak-Is is a pro-government and Islamist trade union confederation. DISK, the Revolutionary (or Progressive, as it is nowadays translated by the confederation) Workers' Unions Confederation, is the main leftist union in the Turkish private sector.